Introducing famous male volleyball players in the most successful team ever. To give credit to arguably the best mens volleyball team of all time - Brazil Mens National Team during the coach Bernardo Rezendes era in the 2000s - we list the most memorable members of the Brazilian team in this section. This team is considered the best and most consistent men's volleyball team of all time  winning nearly every major competition in years 2001  2008. Acccomplishments - Men's National Team of Brazil in 2000's - Is this the Best Team Ever? Gustavo Endres (known simply as Gustavo; born August 25, 1975) is a Brazilian volleyball player. Gustavo's accomplishments with Brazilian men's national team are so great that he could be considered to be the one of the best middle blocker of all time. 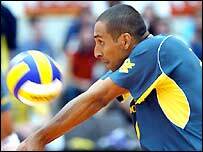 Gustavo played nearly unbeatable Brazilian volleyball team throughout the victorious 2000's. He finished his great career in National Team to the final match of the Beijing Olympic Games 2008. 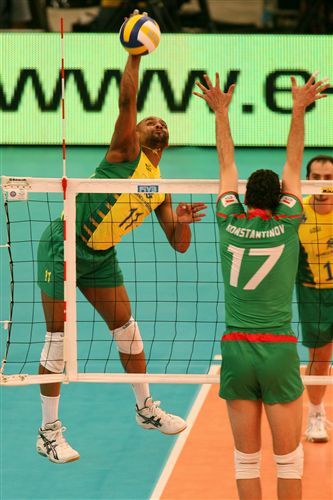 As well as Gustavo he could be named one of the best middle blockers ever. Andre Heller (born December 17, 1975 in Novo Hamburgo) is a three-time Olympian (2000, 2004 and 2008). Sérgio Dutra Santos, nicknamed as Serginho or Escadinha is one other famous male volleyball players from Brazil. Sergio (born October 15, 1975 in Diamante do Norte) has been recognized as one of the best liberos in the world. He is known for his agility, quickness as well as enthusiasm and passion he brings up on the court. 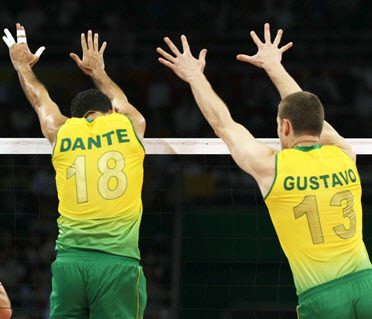 Dante has been a member of the superb men's national volleyball team of Brazil since 1999. His height is 2,01 m and his position is wing-spiker (outside hitter). Teams: Três Corações (Brazil), Suzano São Paulo (Brazil), Minas Belo Horizonte (Brazil), Pallavolo Modena (Italy), Panathinaikos (Greece). 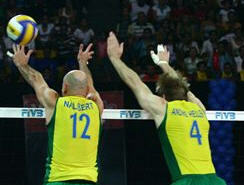 Anderson Rodrigues (born May 21, 1974) is a an opposite hitter of Brazil Men's Volleyball Team. His height is 190cm / 6'3" and spiking reach 330 cm. Read the bio and quotes from Giba by clicking the link below.